iGrewUpIn.com was developed by two long-time newspaper professionals who felt compelled to do something to help the industry that gave them their careers. Local media, small newspapers, in particular, have been in a struggle for their existence. Local media has faced such enormous losses in revenue and paid subscribers that some hometown institutions have been forced to close their doors. Local journalism cannot seem to find a way to reconnect and support itself. Yet the audience for local media remains. Local news has not lost its relevance. What it has lost is a meaningful connection, (beyond the news itself), and a compelling digital distribution channel. We developed a Beta site whose purpose it is to reconnect hometown publishers with the consumers of local content. iGrewUpIn.com is our effort to deliver people to newspapers by providing deeply personal context to local content. 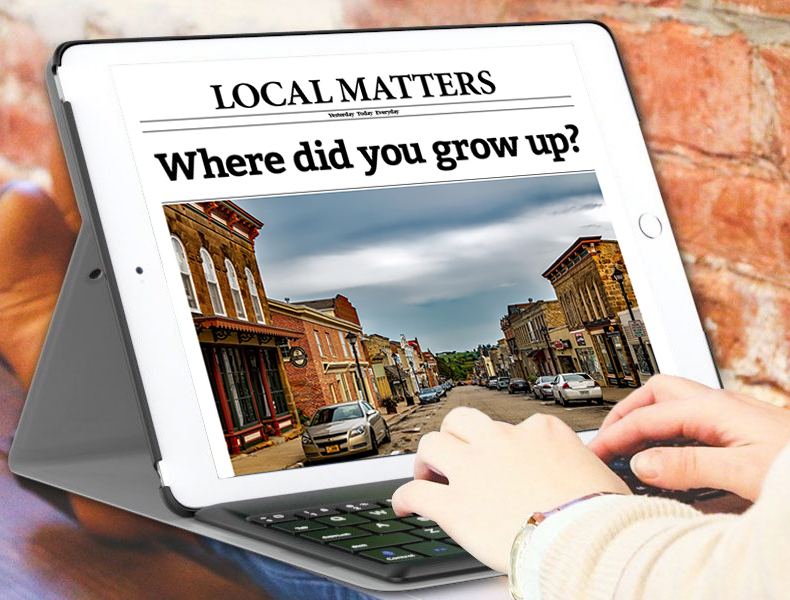 Using a visually focused, niche social site iGUI wants to reconnect hometown newspapers with their readers. It is our belief that local content providers must develop a local social delivery medium of their own or risk riding along forever, on the larger networks hoping for a share of their audience. The news is an inherently a social commodity, and today it is a commodity that requires deeply relatable context in order for publishers to regain it’s emotional connection to the consumer. Our vision is one that we hope to share with the newspapers of our hometowns; a niche social delivery medium where content and its method of delivery are meaningful and emotionally connected to its members. The industry has learned that websites focused on news alone are not drawing traffic. They have also learned that the reigning social media giants do not have publishers best interests at heart when it comes to distribution. Content consumers are just recognizing the reality of fake news, delivered via oversized social media. There is nothing more genuine than local hometown news, news from the trusted sources we grew up with. Publishers need to present local content in a unique way and design a personal, interactive experience with the consumers of local content. When consumers of local content search for news, we want them to find it at iGrewUpIn.com. We want them to reconnect with old friends, their hometown and trusted local media. As for local businesses, they know social media advertising is important, but how local is today’s social media? Or better yet, how local can it be? Why can’t newspapers take back a bit of the audience and revenue lost to oversized social media and offer local advertisers social media at a local scale? At iGUI we have learned that the ties that bind are forged in Geo-social spaces. Context and the connection to one’s own Geo-social space are required for local content to resonate anew with the consumer. iGrewUpIn is not a nostalgia site. To be sure, nostalgia is part of the hometown context. The feeling of nostalgic euphoria inherent in the concept is the connection that becomes the glue between publishers and the members. When we apply the concept and stress the relevance of Geo-social space, it is clear that iGrewUpIn.com is a portal to the past and link to where we live today.